—Image Credit: X-ray: NASA/CXC/Penn State/S. Park et al. Optical: NASA/STScI/UIUC/Y.H. Chu & R. Williams et al. 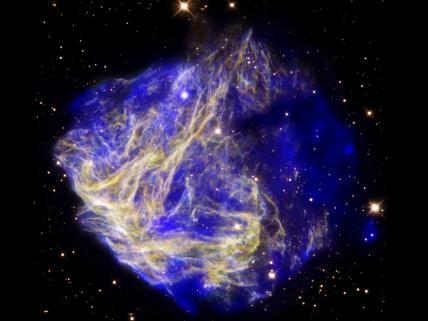 This composite image shows N49, the aftermath of a supernova explosion in the Large Magellanic Cloud. A new long observation from NASA’s Chandra X-ray Observatory reveals evidence for a bullet-shaped object being blown out of debris field left over from an exploded star. In order to detect this bullet, researchers used Chandra to observe N49 for more than 30 hours. Using the new Chandra data, the age of N49 — as it appears in the image — is thought to be about 5,000 years and the energy of the explosion is estimated to be about twice that of an average supernova. These preliminary results suggest that the original explosion was caused by the collapse of a massive star. I may go to once a week on this and the Birthday series. Especially the latter. But we will see. Thanks.